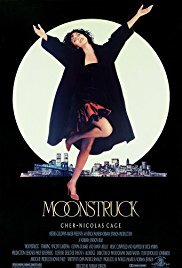 Moonstruck, starring Cher, Nicolas Cage, Olympia Dukakis, Danny Aiello and Vincent Gardenia. PG, 103 minutes, 1987. A superstitious Brooklyn widow, engaged to a mama’s boy, falls for her fiancé’s estranged brother. Come early for light refreshments served at 9:30. Doors close at 10 a.m. No admittance after the movie begins. All films are shown with English subtitles when available.